Winmate 15" stainless panel PC is embedded with Intel Atom N2600 1.66 GHz for ultra low power consumption, It use polished CNS 304 stainless steel enclosures with smooth surfaces, the optional resistive or P-Cap touch screen allows for simple operation via custom software applications. This device is designed as a stylish rugged panel pc / display and serve well as space-saving solutions. Figure 1 shows that the true flat design give this device an elegant touch and rugged at the same time, it is perfectly fit for harsh industrial environment. 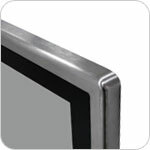 Winmate 15" stainless panel pc and display come in many different configurations. Our waterproof IP65 model came with four special IP65 ports that required screw-on adapter cables to provide external connectivity.